Previously considered two different strands within continental thought, this book compares and contrasts Hegel's 'phenomenology' and Foucault's 'genealogy', contending that in spite of their differences, these approaches share important commonalities, most notably in the manner in which they dispense with distinctions between subject and object, theory and praxis, mind and body, and reason and nature, thus pointing the way to a form of social and political theorizing without presuppositions. Considering the possibility of developing a dialectical approach of 'phenomenology' and 'genealogy', this volume develops our understanding of critical theory, whilst engaging in debates concerning truth and knowledge in the philosophy of the social sciences. 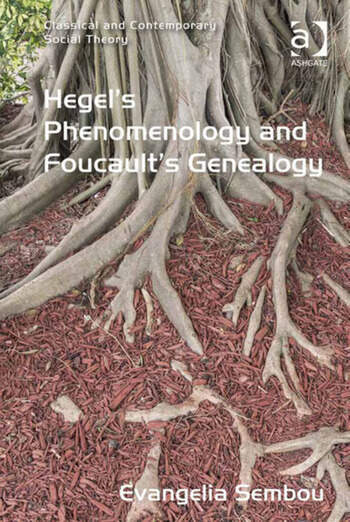 A rich exploration of the significance and implications of Hegel's 'phenomenology' and Foucault's 'genealogy' for the social sciences, it will be of interest to philosophers, as well as to social and political theorists. Evangelia Sembou was born in Athens, Greece. She holds a B.A. in Politics and History from Queen Mary and Westfield College of the University of London, an M.Sc. in Social and Political Theory from The University of Edinburgh and a D.Phil. in Politics from Oxford University. She has taught at the Oxford University Department for Continuing Education and at several Oxford colleges, as well as at the Faculty of Continuing Education at Birkbeck, University of London, UK.